, Floor 64 Research, and Boston Consulting Group show. The digital era is starting to benefit both Europe’s content producers and consumers. Boston Consulting Group’s “Follow the Surplus” report (disclosure: commissioned by Google), published this week reveals growing confidence in online content. Three quarters of consumers surveyed in nine European countries judged that online content had improved in quality, and nearly two thirds expect continued improvement. The report also noted that two-thirds of respondents value the diversity of information and opinions available to them online, and substantial majorities (as high as 75% in some countries) are more excited about the benefits of the Internet than they are worried about any perceived risks. This optimism is generating a large ‘consumer surplus’ - the theoretical value consumers attribute to a product or service above and beyond what they paid for it - valued at an average of EUR 1,100 per person per year for online media. 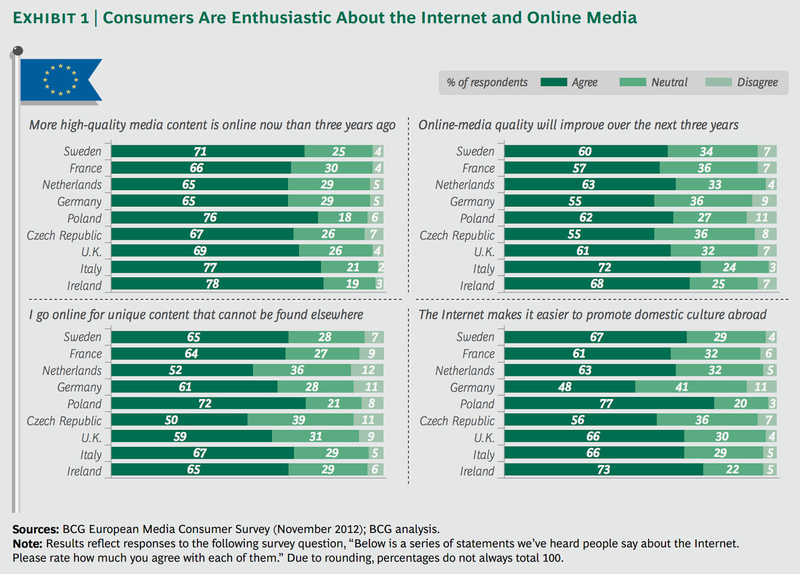 It’s clear too that European consumers are increasingly willing to pay for content. Booz’s report (disclosure: also commissioned by Google) calculates digital revenues at €30 billion higher in 2011 than in 2001. Floor 64’s research shows that in 2007, there were just 11 legal digital music services in Germany, in 2011 there were 68. The British Recorded Music Industry’s recent annual report says UK digital music revenues last year overtook sales or records and CDs for the first time. And according to the International Federation of the Phonographic Industry’s Digital Music Report 2013, digital revenues now account for 34% of total global revenues for the recording industry. These reports all paint a picture of a large digital opportunity for the creative sectors - and of an industry in the process of reorienting itself to the online world. We’re keen to partner with the creative sectors and answer growing consumer demand for quality online media. The Internet has been disruptive for the media industries - film, television, gaming, music, books and news. But it’s now becoming clear that whilst initially painful, this disruption is proving positive, as three recent studies released by Booz & Co, Floor 64 Research, and Boston Consulting Group show. 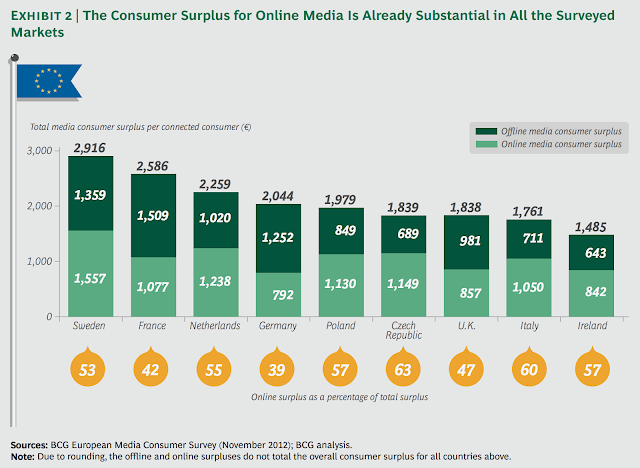 The digital era is starting to benefit both Europe’s content producers and consumers.